Growing up with my grandfather, who was part German, I became cultured on the finesses of good German meat at an early age. It wasn't until I was in my twenties, living away from home, that I realized anything purchased at the grocery store didn't pass muster with my early honed taste buds. Only the good stuff that came from his house was worth salivating for. 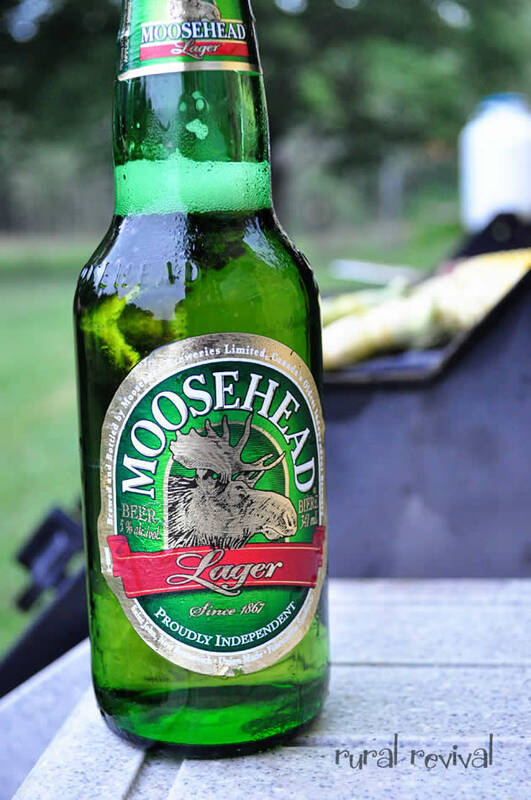 So while we're all still adjusting to our first summer without him here for a delicious barbeque, we can still relive those memories of summer dinners past. The butcher shop he frequented for more than forty years is still in business and much to my delight, my brother stopped in there on his way to the old farmhouse for a family celebration recently, bringing with him some good old German goodness. The next night we cooked up what, as a child, was my favourite summer dinner. And you know what? It's still as good as it was then, except now, it is simply a delight to eat what is fresh, in season and all supplied locally. Even the sausage, while it may not be from a supplier down the road, still easily falls within the 100 mile diet rule. 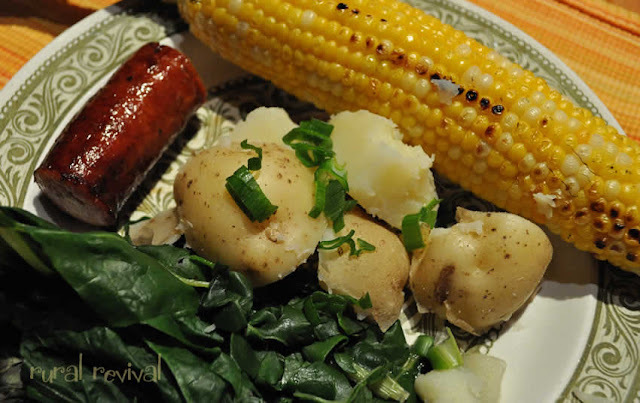 Local corn on the cob, new potatoes, German frying sausage and swiss chard straight from our garden. A simple and simply delicious summer meal. And since my mom is sure to read this, I'll be honest, swiss chard was not on the menu when I was a kid. Well, it might have been but I wouldn't have touched it with a chopstick. Can I have an Amen for mature taste buds please? Once we were finished and replete with fresh goodness, the Artist declared he could certainly see why this was my favourite summer meal. But I'm fairly certain, he had an addition with his that wasn't on the menu when he was a kid either. What's your favourite summer meal? Oh my...now I simply must get that omelet started of yellow squash, chives and goat cheese...I'm starving now!!! I'll forgo the beer till late afternoon after the weeding!!! That looks delicious! Favorite summer meal? Anything that includes tomatoes, fresh from the garden! mmm, that does look delicious! I'm going to a 'U-Pick' today to get my fresh veggies . . . Okay. Moosehead is made here. It does not fit into your mileage limit. Your dinner looks sublime though. ...and even on the plates he used to serve on!! love this, thanks andrea! Your dinner, especially that corn and the potatoes, looks YUMMY! I love grilled corn on the cob with a bit of lime zest in the butter... and you can never go wrong with new potatoes from the garden, especially the yukon gold variety. I think I'll make YOUR dinner me favorite... maybe add some raspberry shortcake to keep the dessert in the 100 mile rule too! 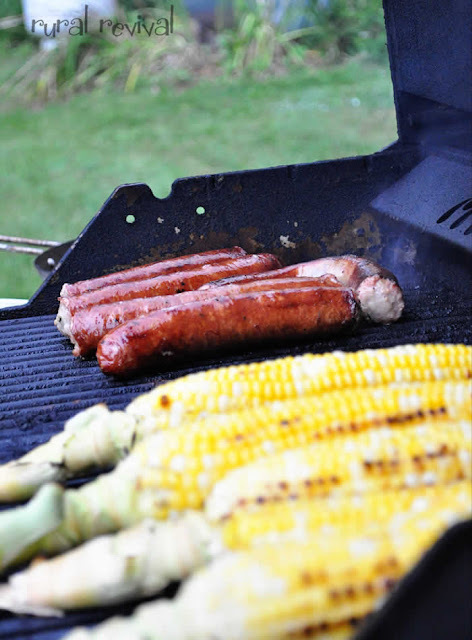 That corn looks so delish grilled-I've never tried it that way. My favorite summer meal is just plain ol' brats over the beach fire, with beans and potato salad. However, you speaking German reminded me I haven't made German potao salad in a long time. I'm putting that on next weeks menu right now. It's a little more work, but well worth it! You have got me starved to death now! Yum, your supper looks delish! 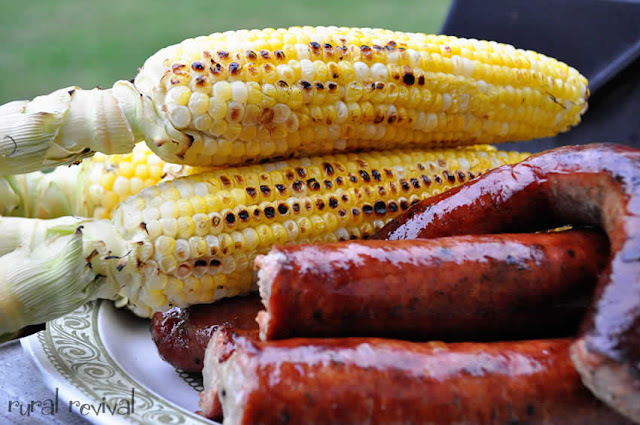 Love corn on the cob (ate my first the year from the garden yesterday) and BBQed sausage. Looks so delicious! Perfect summer meal! Oh yum Andrea...that looks delicious! I love that it's a meal that brings back happy memories of your Grandpa for you. I would say my favorite summer meal is pork ribs with a home made rub and cooked in the slow cooker then put on the BBQ for a bit of smoky flavor with fresh corn on the cob, home made potato salad and fresh tomatoes from the garden. Oh goodness my mouth is watering and it's 11:25pm. Time for bed before I go raid the fridge!